One of the presents I got for my birthday was the dvd of 'Quantum of solace', the most recent James Bond movie. I didn't see this one in the cinema. When I watched it yesterday, I really enjoyed it, but I also realised that a lot had changed since the Eighties. This movie had been stripped of everything that makes it a James Bond movie, which I think is a shame. Some cliches should never be lost. 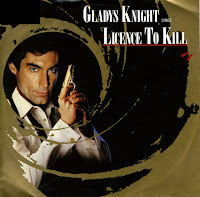 The same goes for the theme song: 'Another way to die' by Jack White and Alicia Keys is a tuneless, soulless affair, while Gladys Knight's 'License to kill' from twenty years ago is still spot on. It was Gladys Knight's last hit, peaking at number 6 in the UK singles chart and number 2 in the Dutch Top 40. During live performances artists have a tendency to speak with their audiences, introducing songs and such. It is a rare thing when this happens on a record, but that's exactly what happens here: Gladys Knight speaks about 'hearing a beautiful song that expresses that feeling of loneliness'. 'Help me make it through the night' was written by Kris Kristofferson for his 1970 album 'Kristofferson'. Gladys Knight & the Pips recorded their cover version in 1972. It peaked at number 11 in the UK singles chart that summer. 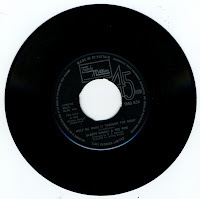 My copy of the single is an original UK pressing, although the center has been punched out and it comes in a mutilated custom white paper sleeve.